The Tories don't care about public sector debt. If they could shovel the lot into the City of London they would gladly triple the deficit. Their real goal is trashing the social contract and destroying the welfare state. Asia will set the new 'benchmark' for wages and social conditions, while fiscal policy ensures that public money is funnelled to private corporations. The tories have always claimed from day one that the UK's National debt would double by the end of the decade. We know that Labour's PFI schemes caused much of this. Osborne claims that the real crisis is in the UK's budget defecit which equates to £1 in every £4 going down the drain on servicing this debt interest. He claims to have reduced this by 25% within the 24 Months of this Tory/Liberal coalition. It appears he is right. Therefore the Tories will be very pleased with themselves as their Number one tactic will be seen to have worked come the 2015 GE. ......meanwhile, Labour Councils close care homes. It looks like you've confused debt and deficit again. As a business person, I'm sure you don't need me to explain the difference to you. As you can see, debt has continued to rise. 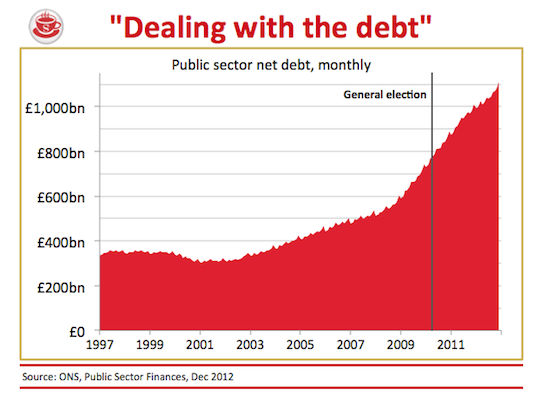 Some of this is historical PFI debt (a programme the Tories are continuing, btw). The deficit on the other hand has not been "slashed by a quarter" - see here. The figure is, in actual fact, 2%. Also, the debt repayments on the debt is inflated. The Bank of England has been buying up government bonds (gilts) with quantitative easing. Approximately a quarter to a third of the national debt is held by the bank which, in turn, is owned by the state. So a huge proportion of the debt is fictitious. It does not exist, and with it goes a chunk of the debt repayments. I suppose its what you want to hear and what you don't want to hear. I have no great desire to promote the Tories but what I wrote above is what they will head into 2015 on. QE is the great big con where a Chjancellor by-passes parliament. In the tradition way, he speaks to the House on budget day and it is voted on. QE is done by sitting on Tony Blair's sofa and isues another £50bn worth of free money. Each £50bn is equivalent to a 0.5% rise in interest rates so (£350bn=3.5%+0.5% BoE rate = 4% true interest rate for the UK. You need to go back to economics school (NOT Labour's)and you will thank me. I didn't confuse the issue.